History: This invoice is part of a collection of bills, invoices, and mortgage receipts donated to the Museum by Loleta Adkins in 1991. Ms. Adkins donated more than 1,500 pieces to the Museum. Most of them date from the turn of the century. Many of them document aspects of the lives of Samuel Greene Hall (1836-1911) and Mary Florence Huggins Hall (1843-1922). Samuel Greene Hall was born in Winston-Salem and moved to Wilmington after the Civil War. He married a local Wilmington woman, Mary Florence Huggins. Hall was a printer, a member of the Hanover Lodge of the local fraternal group the International Order of Odd Fellows, and a founding member of the First Baptist Church. Mrs. Hall was an active member of the First Baptist church. The couple had many children, only one of whom survived to adulthood. 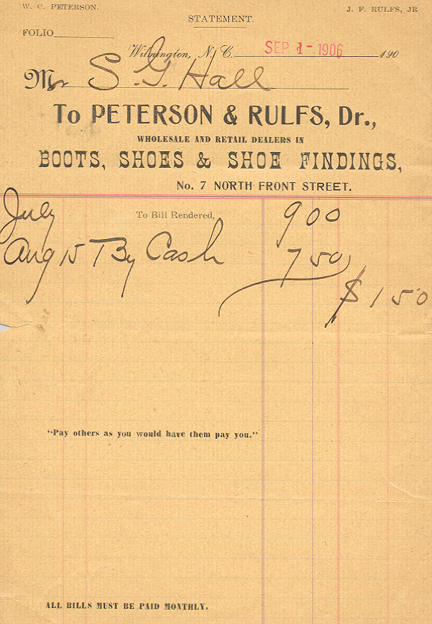 William C. Peterson and John Rulfs, Jr., became partners in a shoe dealership in the 1890s. They stayed in business together into the early 1930s. Their shoe store was originally located at 7 North Front Street, but moved to 202 North Front Street in the 1900s. The downtown commercial area centered on Front and Market streets was home to a number of shoe stores and dealers.